Dr David Thurston, consultation psychiatrist from Oxford Health NHS Foundation Trust, has been commended by the Chief Constable of Thames Valley Police for bringing mental health issues into focus within the criminal justice system. A consultation psychiatrist from Oxford Health NHS Foundation Trust has been commended by the Chief Constable of Thames Valley Police for bringing mental health issues into focus within the criminal justice system. Dr David Thurston, from the Oxford City and North East Area Mental Health Team (based at the Warneford Hospital in Oxford) has been recognised at a Commendations Ceremony. The commendation recognises Dr Thurston’s contribution to the development and running of the Criminal Justice Mental Health Panel for Oxfordshire. He was instrumental in setting up this panel, which deals with issues that crop up during mental health assessment in custody. 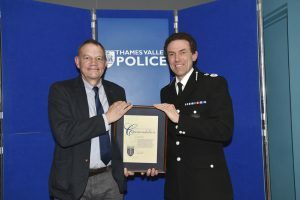 Dr Thurston was nominated for the accolade by Thames Valley Police’s Criminal Justice Department. He was described as an “exceptional example” of supporting the Force’s Values and Policing Principles in protecting communities, working with police and partner agencies to develop strategies that help vulnerable victims through the criminal justice process. The Criminal Justice Mental Health Panel has grown and been renamed since it was established in 2002: it now consists of members from relevant partner agencies in Oxfordshire, who have joined forces to tackle the complexities of dealing with suspects who have mental health conditions. Dr Thurston was among police officers and members of public who received commendations for a variety of reasons from the Chief Constable at a ceremony held at Holdsworth Hall, at the Force Training Centre in Sulhamstead, Reading, during the week beginning 2nd May 2016.